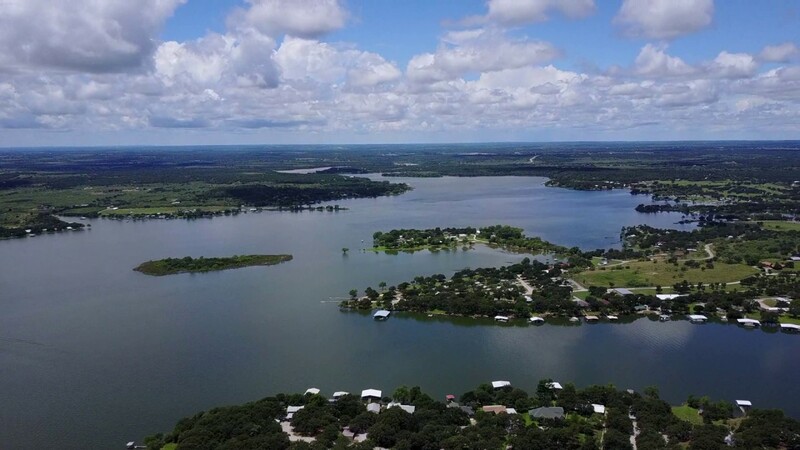 Lake Leon, also known as Leon Reservoir, is located five miles southeast of Eastland in Eastland County, on the Leon River, a tributary to the Brazos River. The reservoir is owned by the Eastland County Water Supply District for municipal and industrial water supply purposes. Lake Leon was authorized by the State Board of Water Engineers (Permit No. 1629) on July 8, 1952. Construction for the dam began January 13, 1953 and was completed in June 1954. Deliberate impoundment of water began in April 1954. The dam is a rolled-earth embankment 3,700 feet long, 90 feet high, and 20 feet wide with the top at elevation 1,398 feet above mean sea level. The uncontrolled emergence spillway is located at the left end of the dam and is cut through at natural ground with a crest of 1,200 feet long at an elevation of 1,382 feet above mean sea level The uncontrolled service spillway (circular drop inlet) is located near the center of the dam with a crest elevation at 1,375 feet above mean sea level. According to the 2015 TWDB survey, the reservoir has a capacity of 28,042 acre-feet and a surface area of 1,756 acres at conservation pool elevation of 1,375 feet above mean sea level. The dam controls a drainage area of 252 square miles.